How to swap or exchange objects in Java? In any object-oriented programming language, Overriding is a feature that allows a subclass or child class to provide a specific implementation of a method that is already provided by one of its super-classes or parent classes. When a method in a subclass has the same name, same parameters or signature and same return type(or sub-type) as a method in its super-class, then the method in the subclass is said to override the method in the super-class. Method overriding is one of the way by which java achieve Run Time Polymorphism.The version of a method that is executed will be determined by the object that is used to invoke it. If an object of a parent class is used to invoke the method, then the version in the parent class will be executed, but if an object of the subclass is used to invoke the method, then the version in the child class will be executed.In other words, it is the type of the object being referred to (not the type of the reference variable) that determines which version of an overridden method will be executed. Overriding and Access-Modifiers : The access modifier for an overriding method can allow more, but not less, access than the overridden method. For example, a protected instance method in the super-class can be made public, but not private, in the subclass. Doing so, will generate compile-time error. Final methods can not be overridden : If we don’t want a method to be overridden, we declare it as final. Please see Using final with Inheritance . Static methods can not be overridden(Method Overriding vs Method Hiding) : When you defines a static method with same signature as a static method in base class, it is known as method hiding. The following table summarizes what happens when you define a method with the same signature as a method in a super-class. Private methods can not be overridden : Private methods cannot be overridden as they are bonded during compile time. Therefore we can’t even override private methods in a subclass. (See this for details). The overriding method must have same return type (or subtype) : From Java 5.0 onwards it is possible to have different return type for a overriding method in child class, but child’s return type should be sub-type of parent’s return type. This phenomena is known as covariant return type. Overriding and Exception-Handling : Below are two rules to note when overriding methods related to exception-handling. Rule#1 : If the super-class overridden method does not throws an exception, subclass overriding method can only throws the unchecked exception, throwing checked exception will lead to compile-time error. Rule#2 : If the super-class overridden method does throws an exception, subclass overriding method can only throw same, subclass exception. Throwing parent exception in Exception hierarchy will lead to compile time error.Also there is no issue if subclass overridden method is not throwing any exception. Overriding and synchronized/strictfp method : The presence of synchronized/strictfp modifier with method have no effect on the rules of overriding, i.e. it’s possible that a synchronized/strictfp method can override a non synchronized/strictfp one and vice-versa. In C++, we need virtual keyword to achieve overriding or Run Time Polymorphism. In Java, methods are virtual by default. We can have multilevel method-overriding. Overloading is about same method have different signatures. 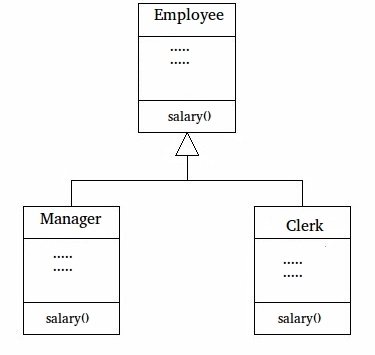 Overriding is about same method, same signature but different classes connected through inheritance. 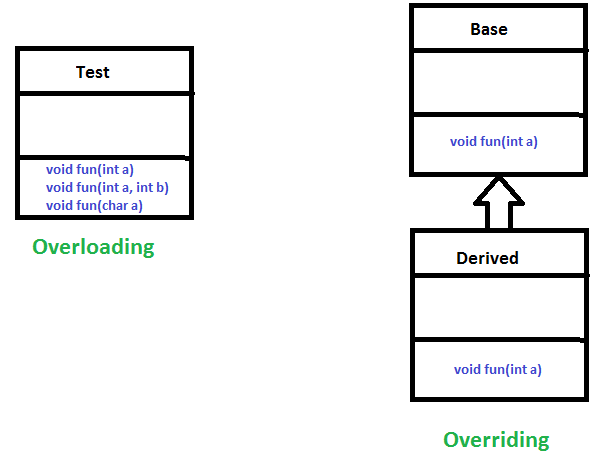 Overloading is an example of compiler-time polymorphism and overriding is an example of run time polymorphism. As stated earlier, overridden methods allow Java to support run-time polymorphism. Polymorphism is essential to object-oriented programming for one reason: it allows a general class to specify methods that will be common to all of its derivatives, while allowing subclasses to define the specific implementation of some or all of those methods.Overridden methods are another way that Java implements the “one interface, multiple methods” aspect of polymorphism. Dynamic Method Dispatch is one of the most powerful mechanisms that object oriented design brings to bear on code reuse and robustness. The ability of existing code libraries to call methods on instances of new classes without recompiling while maintaining a clean abstract interface is a profoundly powerful tool. Overridden methods allow us to call methods of any of the derived classes without even knowing type of derived class object. 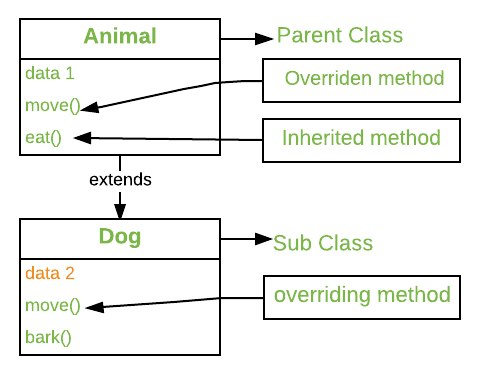 Overriding and Inheritance : Part of the key to successfully applying polymorphism is understanding that the superclasses and subclasses form a hierarchy which moves from lesser to greaterspecialization. Used correctly, the superclass provides all elements that a subclass can use directly. It also defines those methods that the derived class must implement on its own. This allows the subclass the flexibility to define its own methods, yet still enforces a consistent interface. Thus, by combining inheritance with overridden methods, a superclass can define the general form of the methods that will be used by all of its subclasses. Let’s look at a more practical example that uses method overriding. Consider a employee management software for an organization, let the code has a simple base class Employee, the class has methods like raiseSalary(), transfer(), promote(),.. etc. Different types of employees like Manager, Engineer, ..etc may have their own implementations of the methods present in base class Employee. In our complete software, we just need to pass a list of employees everywhere and call appropriate methods without even knowing the type of employee. For example, we can easily raise salary of all employees by iterating through list of employees. Every type of employee may have its own logic in its class, we don’t need to worry because if raiseSalary() is present for a specific employee type, only that method would be called. This article is contributed by Twinkle Tyagi and Gaurav Miglani. If you like GeeksforGeeks and would like to contribute, you can also write an article using contribute.geeksforgeeks.org or mail your article to contribute@geeksforgeeks.org. See your article appearing on the GeeksforGeeks main page and help other Geeks. last_page How JVM Works – JVM Architecture?